Being a part of a medical mission to a poor village in Nicaragua was both heartbreaking and heartwarming. Nicaragua is the second poorest country in the Western Hemisphere, behind only Haiti for this “honor.” Nicaragua’s bloody past, its communist regime with occasional socialist overtones, and the desire of successful countries to take advantage of this poverty for their own benefit all mixed together to slap me in the face with a reality check. In spite of these terrible limitations, however, the people with whom I worked were gentle, kind and filled with love. We set up the inaugural medical clinic at the host site, the Mama Margarita Foundation. More groups will be coming throughout the year to staff the clinic – one in April and another in late 2018. We set up a spreadsheet of patients and diagnoses to be used moving forward, as well as a chart system of medical records so subsequent practitioners can see what has been done. 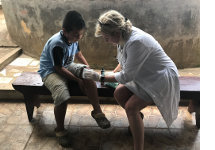 The Foundation was able to find two local physicians who work with NGOs to assist with referrals and prescriptions, and working with them added to this wonderful experience. The population for whom we did “consultations” was predominantly women and their children. We had expected to see a fair amount of diabetes and hypertension related to poor diets, but in fact we saw mostly abdominal pain/diarrhea with likely anemia, as well as respiratory complaints which could be attributed to wood fires for cooking which are located adjacent to the home. We saw very few men. We saw 136 “official” visits, but this did not include house visits or injuries we saw when the clinic was closed. We were also fortunate to have the opportunity to go to a local municipal dump site to provide food, gloves, masks and health care. It was a sobering and somber experience but one I am glad I was able to do. I was very proud of my medical residents who accompanied me on this trip. Luis and Alex were mature, empathetic, hard-working and creative. We did house visits when patients could not leave their homes, and the care they displayed in these humble homes was touching. We also brainstormed ways we could continue to improve the health of the community after we left, for the next group to continue. These ideas include basic hygiene lectures (some people did not have soap), ways to vaccinate the community (no one had any vaccination records, although some reported they had received some shots) and regular treatment for intestinal parasites. Thank you for the opportunity to broaden my horizon and share the experience with trainees. 96% of humanity is outside our country’s borders, and experiences like this help me build connections and understanding while others build walls.